Whitehall’s chances to claim an Adirondack League East division title took a serious hit after the team suffered a crushing loss to Argyle last Friday. The Scots defeated Whitehall 12-0 and took a two-game lead over the Railroaders entering the final week of the season. The game was played at Moreau Rec. because of poor field conditions in Whitehall. Argyle pounded out 14 hits in the game and Ashley Ellis pitched very well, limiting Whitehall to four hits while striking out four. Hannah Kennedy had three hits, including two doubles for Argyle, and Shelby Graham had three RBIs. Brittney Putorti struck out six hitters in the game but was hurt by five walks as she lost for only the fourth time this season. Ariel Ayers, Jackie Raino, Carli Varmette and Michaela McCoy all recorded singles for Whitehall. Varmette also made several outstanding defensive plays at shortstop. The Scots jumped out to an early lead, scoring four runs in the first on consecutive two-run singles. They added six more runs in the fourth inning. 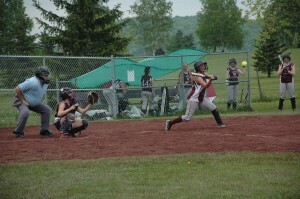 For Argyle, the win avenged a 2-1 loss to Whitehall on April 23, and with a 2-0 win over Fort Ann on Monday, gave the Scots a 1.5 game lead over the Cardinals and a two-game lead over Whitehall in the Adirondack League East division. The Railroaders bounced back from the loss with an impressive 11-0 victory over Salem on Monday evening. Putorti struck out 11 batters and allowed only two hits in the complete game. She helped her own cause with a pair of singles and three RBIs. Victoria Christian added two RBIs on two hits and Maggie Benjamin went 2 for 3 with an RBI. Whitehall scored two runs in each of the first two innings, three in the fourth, and four in the sixth. The Railroaders also picked up an impressive win over Lake George last Wednesday, knocking off the Adirondack League West division champions, 4-0. Putorti was masterful on the mound, striking out 10 and limiting the Warriors to six hits in a complete-game shutout. Victoria Christian and Olivia Short each had two singles for Whitehall. The Railroaders scored a pair of runs in the third and sixth innings. Whitehall was aided by four Lake George errors that led to three unearned runs. The Railroaders are now 10-4 and have an outside chance of finishing in first place in the East division if they win out, Argyle loses its final two games, and Fort Ann loses to Lake George. All those games were scheduled to be played earlier this week after the paper went to press. Whoever emerges from the East division will play Lake George for the Adirondack League Championship tomorrow at Castleton State College. Whitehall has already qualified for Sectional play and will learn its opponent next week.